Curious About Costs for Dental Implants in Mesquite? Call a Dentist! Dental implant placement is a complex procedure with many steps and moving parts. Fortunately, more people are eligible for them today than ever before thanks to modern advances in dental techniques and technology. However, when you’re trying to determine the cost, things can get a bit tricky. Every patient has their own unique needs to fulfil before dental implants can be viable. 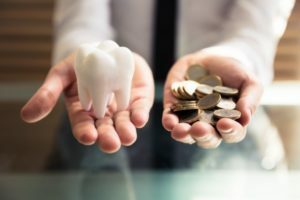 To learn how the cost of dental implants in Mesquite is determined and what you should do to get an estimate, keep reading. Why is Determining Cost So Difficult? It’s a little-known fact that teeth are just about as unique as fingerprints. Therefore, replacing them is not an easy task, especially once you get the tooth roots involved. Advances in implant technology allow dentists to place implants more easily and effectively, but that doesn’t mean people will necessarily have enough bone volume in their jaw to have them placed. Besides the number of implants you need placed, costs can vary depending on the type of implant being used. It depends on which manufacturer is providing the implant and the quality overall. Titanium implants can vary in cost when compared to zirconia, for example. Abutments are connectors that attach the restoration to the implant itself. These can vary in cost depending on the implant and restoration used. Furthermore, the restoration is often the most complicated piece to determine the cost for because of how many ways you can replace teeth. For example, a single-implant retained crown is going to be much cheaper than a bridge (three or four teeth) or denture (full arch) retained with dental implants. Finally, dental implant cases may cost more if a patient requires preparatory treatments before they’re are viable for placement. For example, bone grafts are designed to use donated bone materials to increase the overall volume of the jaw bone, therefore providing enough room for implants to integrate to. Sinus lifts work to add bone to the area between your upper jaw and maxillary sinuses. In other cases, patients may need sedation dentistry in order to undergo long oral surgeries like dental implant placement. In conclusion, the best way to get a clear and reliable estimate for dental implants is to schedule a consultation with a dentist! Dr. Byron McKnight earned his Doctor of Dental Surgery degree from the Baylor College of Dentistry. Since then, he’s taken over 2,500 hours of continuing education, including on the study of dental implants. To learn more about the cost of dental implants or about his practice, you can contact him through his website. Comments Off on Curious About Costs for Dental Implants in Mesquite? Call a Dentist!